BATON ROUGE — The Baker Range was packed out last Saturday for the first Chamber of Commerce of East Baton Rouge Gun Training Program. After the classroom instruction, the students went to the firing range, where they had one-on-one instruction on firing their own gun, if they brought one, or a firearm provided by the instructors. Coroner Dr. Beau Clark, who has served on the Sheriff’s SWAT team, was one of eight instructors who provided one-on-one training. For some of the students, it was an emotional experience. One middle-aged lady was living in fear at her home but was deathly afraid of firearms. She was shaking as she touched her gun and nearly passed out when the lady in the next lane began to shoot. But, with the help of a lady instructor, within 10 minutes, she underwent a miraculous transformation. She learned to adopt a shooter’s stance and was pumping bullet after bullet in the bull’s eye. With a smile, she turned and said, “That was fun!” She said she has more self confidence and will feel much safer in her home. 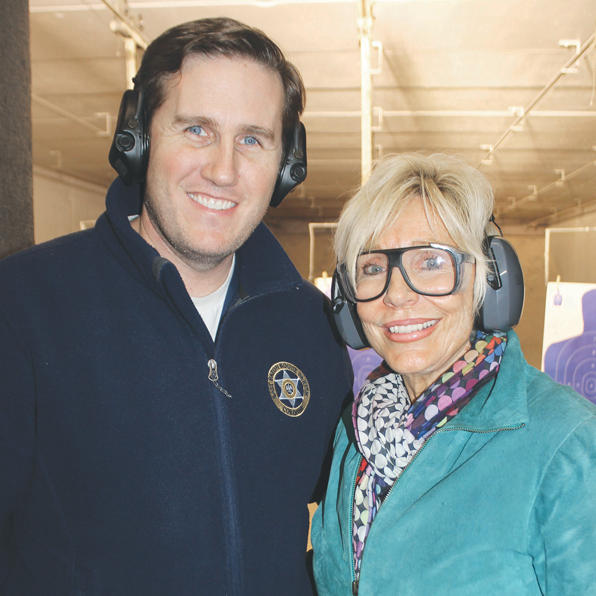 Former Sheriff Phares said, “For ladies, a firearm is the great equalizer.” The Chamber EBR will announce details soon on how to register for April 4 class.